Gathered from actual comments made about The Crown Conspiracy from people I’ve never met. This was quite possibly the worst written book I have ever read and am absolutely amazed at the high ratings others have given this. Although I have only read your first book I must say that it is probably one of the absolute best books I have ever read! Do yourself a favor and avoid this atrocious book. On it's own The Crown Conspiracy is good but as a series The Riyria Revelations is brilliant. No serious fan of the fantasy genre will enjoy this book. THE CROWN CONSPIRACY re-kindled my love of the Fantasy genre in a way I didn't even realize it needed re-kindling. But worse, far worse than any of that, is the actual writing style. It is, quite simply, the worst I have any seen in any printed material in my entire life. The writing is easy and flows with a voice that is decidedly deft. Sullivan has produced some great writing that is efficient and to the point. These made me rethink my initial opinion but were short lived and again ruined by the poor writing. The pacing is pitch-perfect. There is not a page unused or wasted in the whole book. 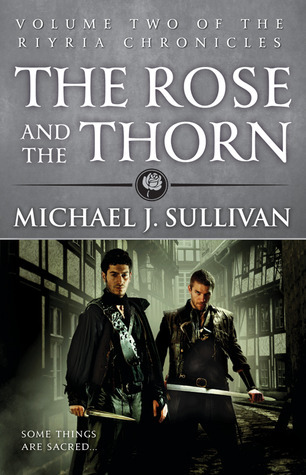 In a less skilled author’s hands, this could have been a far longer and more tedious read, but again Sullivan leaves me in awe as there isn’t a sentence I’d say isn’t required. The English language was absolutely butchered in an almost insulting way. The man creates the world with a simple prose that brings to mind things like woodsmoke from a stone chimney, rain spattering a windowpane, snow gently falling outside while a candle burns silently away in a shop window, or a lazy river meandering its way through the lush countryside. It's amazing that such a poorly written book could receive such high ratings. Michael J. Sullivan has written a book I will read over and over again and it most definitely will always reside on my favorite’s shelf. The characters are like cardboard cutout stereotypes and entirely predictable. There is absolutely no subtlety at all and, if the characters are easy to understand, it's because they have so little depth. Royce and Hadrian are two well-developed characters shrouded in mystery and written with a delightful dry wit that few veteran authors could emulate. For me, the characters never evolved from simple, ordinary constructions found in any fantasy novel to somebody with life, reasoning skills, or emotion. The characters are entertaining and evolving, without turning cheesy and predictable like they do in so many fantasy series. They were as dead as paper. Honestly, I couldn't bring myself to care about a single one. At first I wasn't sure if I was really going to bond with any of the characters, but to my delight I found myself loving Royce and Hadrian. I felt the characters weren't as developed as I would have liked. I could not get behind the shallow characters and their motivations. The characters were witty and likeable, and the story was very believable, something you could actually see happening. For the most part, the prince was the same character all the way through and then just developed all of a sudden at the end. That’s not to say the supporting cast aren’t equally impressive, as I think Alric’s personal transition is amazing. Characters made in a completely stereotypical cookie cutter form. They are completely lacking in motivation and actually just downright stupidly unlikable. One of the great things about the novel is its realness, the characters are alive in their own right whether it be the silent and snarky Royce or the warmer Hadrian, the sometime hindrance Prince Alric or the lovable and curious monk Myron; you'll fall in love with the characters as much as the action. There is not one believable character who talks or thinks like a living being. Your characters are intriguing, touching, and real: My heart ached for Hilfred when he was on the stand; I felt Myron's sorrow at not being able to become a part of the world in which he is now thrust; and Royce reminds so much of my best friend during high school that it is his face I see speaking Royce's lines. Perhaps it is simply that the characters’ presence in the here and now is so fully-realized that everything else is merely secondary; regardless I’m excited to learn more rather than disappointed that I learned so little. His portrayal of an ancient wizard, using what he thinks is archaic English, made me cringe from start to finish. The wizard has been locked up for 900 years and the way he communicates with the heroes is realistic and funny. I almost never found myself being really blown away or surprised by the plot twists and turns it was rather predictable. The plot was not straightforward and it kept me on my toes trying to figure out which characters were good guys and which were bad guys. It takes a great writer to weave a tale that surprises me, that keeps me in suspense. If you like new fantasists like Peter Brett and Robert Redick, or skilled world builders like George R.R. Martin, Patrick Rothfuss, Guy Gavriel Kay and Joe Abercrombie, there's a high likelihood that you will find this as unreadable as I did. It reminds me of George R R Martin's "Song of fire and ice" except on a lighter, much less confusing and difficult to comprehend at times scale. Needless to say, if you just want a good fantasy novel, pick this one up. I have always loved fantasy and I enjoyed this book as much as I did when I first read Tolkien. It was like combining the styles of Neil Gaiman to that of George R. R. Martin, and it really worked for me. The writing/imagery is basic, the characters are one-dimensional and undeveloped, and the dialogue is tired old cliche after tired old cliche. It doesn't follow the regular rubric of so many fantasy books. The characters are fresh and engaging, I absolutely loved the banter between the two main characters. As this book stands, it's too darned short! It may be shorter then some of the books I have read but it sure does pack quite the punch. I say “The smaller the package, the greater they are”. What can an author take away from all this contradiction? I can take solace in the idea that this list consists of almost all the negative comments I have seen, but doesn't begin to scratch the surface of the positive ones. There are two emails I received this year that, in all honesty, make everything here appear so trivial it’s silly. They are private and very personal messages from fans that I refuse to tarnish by making public, but I am glad to say they were very positive and more than any other comments or money earned--made my year. Thanks Renee & Cort and thanks Major Hill. As an author, writing a blog is a bit strange--or maybe it is just strange for me. I don't know what to write. (Which accounts for the few number of posts I make--well that and I don't have that much time. )It's not that I don't have ideas, or topics I could pontificate on, I have plenty, but does anyone want to read about them? I have no idea because blogging is this odd, one-sided discussion. I ramble about stuff to people all the time, and their expression usually tells me when I should change the subject or shut-up entirely. I don't get that in a blog. 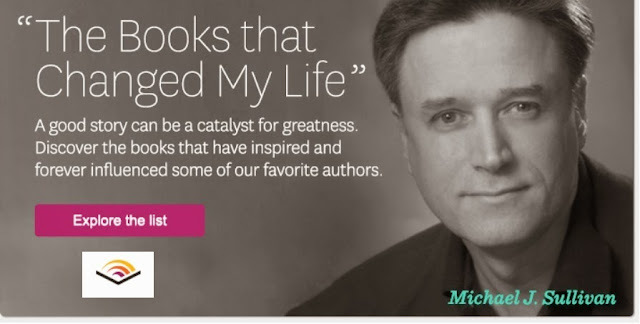 Occasionally someone will leave a comment, but never does anyone post, "This was great, but what I'd really like to hear about is…"
I mean, do you really want to read about how great my books are doing? That sort of thing is interesting to me, but I can't understand why anyone else would really care? It also strikes me as a bit self-absorbed. Would you rather I wrote about writing? I know several readers of this blog are aspiring writers, so would tips and methods be interesting? Some of you might love that while others might be invisibly yawning. What about lifestyle? Is anyone interested in what it is like to be a full-time author? How I spend my time? Would it help to inspire those working toward this goal to see what might be behind door number three? Clearly I am no Fitzgerald or Hemingway, so I have to wonder if that would be appealing. How about rants on the industry? A number of authors have made a fine following by posting impassioned opinions on the publishing business. I have to wonder how interesting that is to read for someone who isn't in the industry. How about my opinions on my genre, what I think is wrong with fantasy books these days, how I feel it could be improved. I don't know. While I have lots of opinions here, I can't think of too many ways to present them without attacking fellow authors, and I'd rather not throw stones given what pretty, big windows I have. I could talk off-subject, ramble about general news items, politics, religion, the state of PC games or the weather. I'm not sure even I would want to read that. Creative writing? Would you be more happy with little stories? That tends to be time-consuming, time that would be better spent working on my books, but I suppose I could do that. Biography? Would to like to hear about my storied past? Would it be interesting? Comforting? Frightening? Inspiring? to hear all the trials and tribulation I went through? Maybe if you gave me a hint I could do a better job at this as we go into 2011. Miraculous changes are coming so I feel I need to nail this down better. My books are doing phenomenal, right now. Robin is beside herself watching the numbers grow like a Christmas Chi-pet. Yesterday I sold 750 Kindles, that's in one day, and that's just Kindles. It wasn't long ago that I was happy to sell one book every three days, and now, if sales continue as they have been, I will sell 10,000 this month. This is just silly. Sure, there are a lot of people out there with Santa delivered e-readers, all looking to fill them, so the numbers are skewed. Still, I thought the same thing last year, but the numbers stayed high, so who knows. Thanks for helping to make this another great holiday season, and here's looking forward to what appears like it will be an amazing new year. As most of you know, I wrote the Riyria Revelations — all six books — before the first was published. As a result, for the last three years I have done nothing but edit. The editing is almost done, and as the end of the series approaches, I have begun thinking about my next novel, even written a couple of chapters. I had forgotten what a rush it can be to create something out of nothing. In some ways it is almost like that movie The Neverending Story where the world is just a black Nothing. I stare at the keyboard, the cursor blinking at me, a singular line pulsating like a silent heartbeat. I think. I imagine. And a light appears in the Nothing. I can see it, this new world taking shape and my fingers begin moving. Building, growing, feeding off itself; scenes, faces, voices, I get lost in it. When I come out, I scroll back and look at the pages. Nothing was there before, now people exist. There is a sense of pride and satisfaction in the act of creation that I had forgotten. The initial rush that has nothing to do with anyone else. This is the kind of feeling that makes you stand up and move, to do a fist pump and grin in the mirror. Writing again, starting a project from scratch, has made me consider the process. Traditionally I do everything the hard way, and it recently occurred to me that there might be new technology that could help. I wrote my first few books on a manual typewriter. A word processor was quite the improvement and as it has been a while, I thought I would do some investigating to what else might be available. I write on a PC. Always have, (at least since the Computer Age,) and since the early nineties I've used Microsoft Word. Word is not exactly designed for the needs of a novelist, but rather for business in general and has everything possible stuffed into it and little in the way of customization allowed. So I was looking forward to finding a tool that was designed with me, and my profession, in mind. Doing a search on writing software results in a number of highly structured programs designed to help those who know nothing about how to craft a story or create a manuscript. These aren't tools for serious writers. They are the literary equivalent of what a paint-by-numbers kit would be to a serious artist. That's not to say that there aren't any genuine tools. While I hadn't heard of any PC programs of note, on the Mac side of the world, I had heard about a program called Scrivener. There might be others, but this is the one that writers with Mac Books raved about. 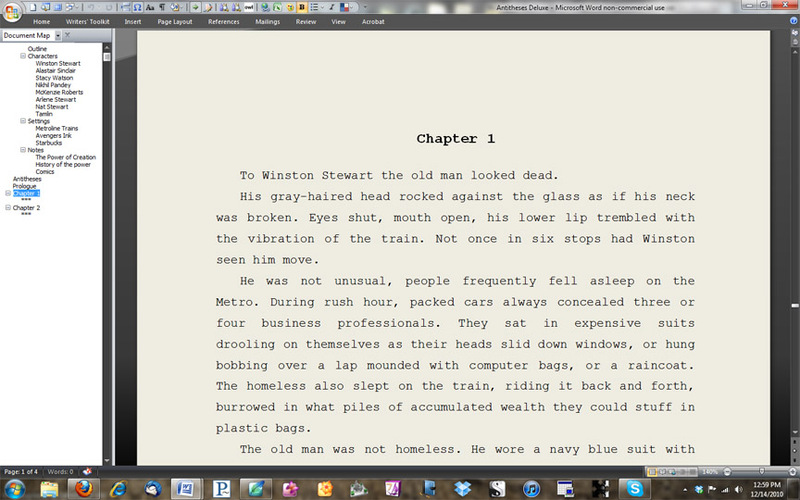 It looks marvelous and recently I discovered there is going to be a Scrivener for Windows. They are in the open beta phase now and "It will be officially released in early 2011." I downloaded the beta and played with the program. I must admit it is very nice, although it suffers from its infancy. 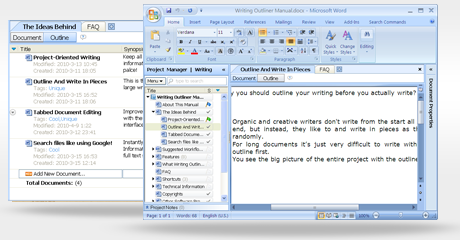 Most writing programs have at their core a word processor and few can hope to beat the gorilla of MS Word for quality and depth. Word has been around since 1983 when free demonstration copies of the application were bundled with the November 1983 issue of PC World, making it the first program to be distributed on-disk with a magazine. A program that has been around for almost three decades, is going to have an edge when it comes to wealth of features and the time to tweak them. As a result, any would-be PC replacement needed to be fantastic just to match up. Sadly, when it comes to the word processor portion of the program, Scrivener doesn't. That is not unexpected. 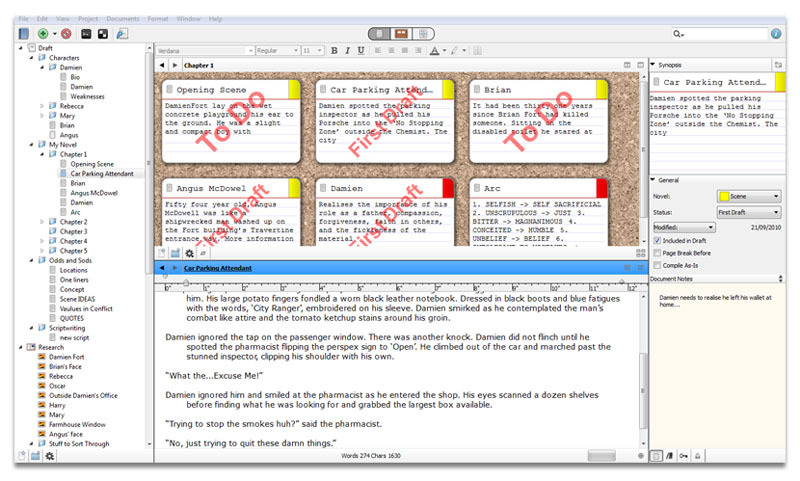 Scrivener hasn't had time to even add all the features of the Mac version, so I try not to hold that against it. The rest of the program is wonderful as it introduced me to the concept of having an in-program file system. Along the left side of the main Scrivener window is a Windows Explorer type of file and folder tree that allows the user to click on, and instantly jump, to another file. This means that you can organize (by drag-and-drop) and instantly open notes, images, or look at an outline, without leaving the word processor. This is convenient and saves the effort of opening windows, finding the files, opening them, adjusting the placement of the windows, etc. It also supports images. I liked this feature quite a bit. I also thought the corkboard where you had a virtual place to layout index cards with notes on them, was fun. After a greater search for other PC programs I found one called Liquid Story Binder. This one looks native to the PC and has had a lot more time to develop. As a result, it has a ton of features. Initially I found LSBX a bit complicated due to the intent by the designers to create a tool that allowed the writer the flexibility to use their tool anyway they wanted. Luckily there are a number of good YouTube tutorials. Once more, in addition to the word processor, LSBX allows for jumping around to different files inside the program, but in addition also has nifty things like a Timeline, Character Dossiers, and Mindmaps. There are also word usage programs that help show when you reuse a word too often, and a bunch of other statistics that might be interesting to an author (or more importantly an editor.) 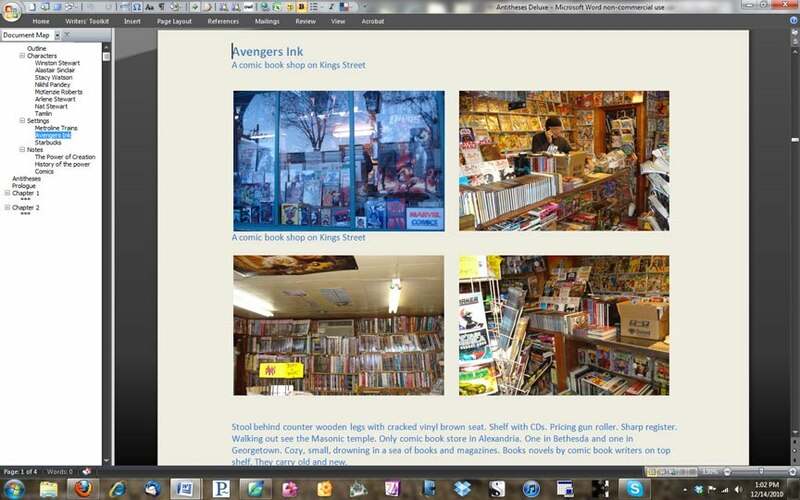 It has storyboarding, image galleries, even a music player to be used for audio inspiration. LSBX looks great too, like a computer game or an art program. Just flipping through the program's website is impressive. The program doesn't come that way. All those beautiful images are things that you, as the writer, are expected to add for research or inspiration. While both of these products were fun to play with, I had to ask myself, would they really help the writing process? Setting up the programs, filling in all the various files, fields, maintaining the character sheets, and outlines is a lot of work and quite time consuming. In many ways it reminded me of the computer game City of Heroes where the character creation process (being very well conceived) was often more fun than playing the game itself. In order to make LSBX look and work like it was designed to, would take several hours, days or weeks (depending on how elaborate you want to be.) The thought of having to set all this up for each new project seemed a bit daunting, and unnecessary. I've written nineteen novels and never needed to do any of this before. Novel writing doesn't require much. A pen and paper will do. A word processor and a notebook is better - good even. All the rest of this I determined was just another distraction, another way to avoid the actual writing. The prerequisite for working goes from the hours put into organizing a real world writing space, to the added task of organizing a virtual writing space. 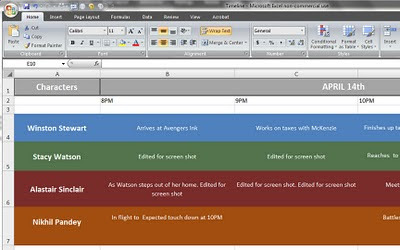 There were two aspects to these programs that I did find beneficial: the ability to access my notes without having to open a new file, and the Timeline feature. The question is: Was this worth the added effort of using either of these programs? I strongly considered it, being that I like playing with new things, but the killer was the word processor. Neither has Word. As I tested these other programs I continuously encountered situations where I could not do something I used to, or not as easily. This was the deal-breaker. The added features are nice, but I must have a word processor that does what I need it to. This got me thinking. Was it possible to add these features to Word? Word has add-ons. Perhaps some enterprising programmer made plug-ins for writers. After several hours of searching I did find Writing Outliner, a Word Add-on that installed a Scrivener style file tree in Word, but after using the demo for this, I was not impressed and found it more of an annoyance. I was irritated that Word had so many capabilities but could not be customized to suit novel writing. All I really wanted was the file access and a timeliner, and maybe the ability to make the giant ribbon disappear to give me more room and clear the clutter. Then it occurred to me that I never even tried. 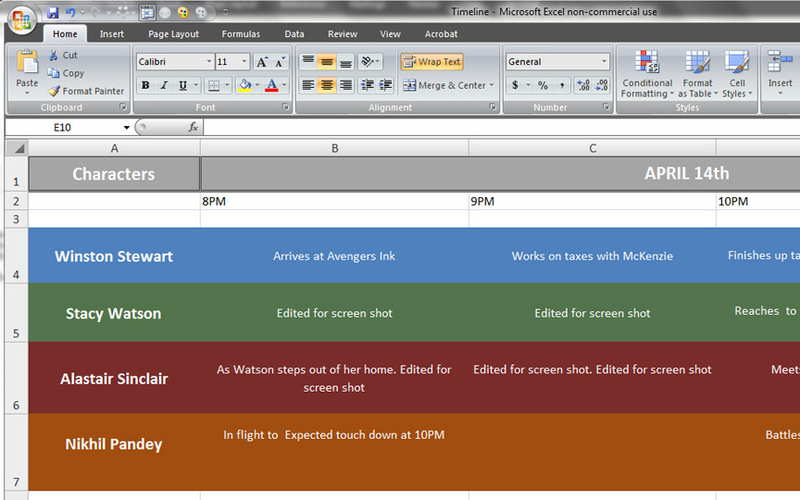 I touched on the idea that a timeline was nothing more than a spreadsheet, and MS Office comes with Excel. I gave it a try and in a few minutes was able to create a timeline for my new story that was more suited to my needs than the ones in the other programs. This only left a means of accessing notes within Word. Then it hit me — the Document Map. Turning on the Document Map creates a side window in Word similar the one in Scrivener. The problem is that clicking on the contents only takes you to various headers in the open file and not to new files. The question that I hit on was, "Why do the notes have to be in separate files?" 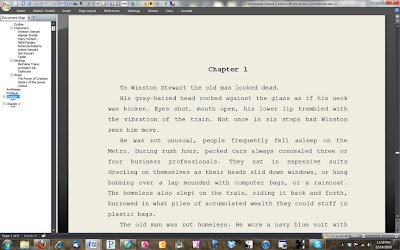 One of the many praised aspects of Scrivener is its ability to let you work in separate files and then auto-combine, or compile them into a single manuscript file. I never saw the benefit of this as I write in linear fashion, so my manuscripts are always in a single file. For me, having multiple files only adds to the confusion. In addition to keeping track of my story, I also have to keep track of where all these separate files are. Did I file that scene under this character, that one, or setting? Can I delete that file now that I placed it in a chapter? I tend to keep things, so soon the files would be cluttered with redundancies and old info. Even when I just used Word, I still have a few note files running around that I lose track of. The idea of keeping everything in a single mapped file was intriguing. The sheer simplicity was beautiful, at least as an idea. I needed to test out the theory. For years I have used the Doc Map to jump from chapter to chapter, and scene to scene within the chapters, but now as I planned to take it to new lengths I put more thought into the whole thing. I created new headers and styles to suit my needs and then began dumping all my notes at the start of my manuscript file. Once there, I divided them into sections: Outline, Characters, Setting, and Notes. Each of these had subheads. I offset the text with color and font to separate it from my actual writing to avoid confusion and reduce the length by putting the notes in a smaller font. I even pulled some of the images I had created while using the other programs and placed them in the appropriate sections. Now with a simple click I could instantly jump to read any note, reference, or view any aspect of my outline using the collapsible-tree Doc Map. And another click would send me back to work. And rather than use a compile tool to generate a finished manuscript file, I just highlight and delete the note portion off the top. Simple. I also discovered that the ribbon bar can be minimized into near non-existence, and there is a full-screen mode that leaves only the text and the Doc Map visible. Add to this the discovery that you can alter the color of the page and Word has been transformed into a very neat, efficient, and similar facsimile to the other writer programs. This one however, uses my familiar Word as the processor. While this solution still lacks some of the more sophisticated and fun toys, they are merely toys and as such would serve more to distract than help the writing process. Honestly, I don't know why Microsoft doesn't release multiple flavors of their flagship processor. With just a few tweaks to the existing program they could offer Word for Novelists, Word for Managers, Word for Journalists, Word for Screen Writers, Word for Salesmen, Word for Executives, Word for Editors, Word for Teachers. The list could be endless, and so could the revenue. 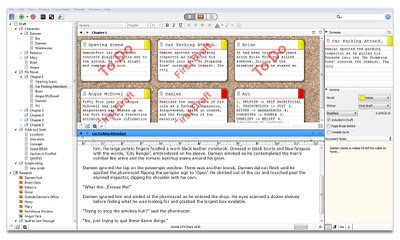 So if you are in the market for a Scrivener-like program for Windows, you're in luck, Scrivener itself will be available real soon. And if you want to play with a highly customizable writing program, you can try LSBX. But if you already have Word and would just like to make the writing process a tad more efficient, you might try customizing it using the Doc Map and the custom menu bar as I have. It isn't as pretty, but it works. I hope you all enjoyed the Avempartha giveaway last month. It is over now. Avempartha for kindle is back up to the ridiculously high price of $2.99. Nevertheless, this momentary drop in price resulted in a number of strange events, not the least of which was putting my books on the Amazon Kindle Movers and Shakers List. Crown was the first to hit it early last month reaching as high as number five. As surprising as this was, I attributed the momentary success to the Avempartha giveaway. Tens of thousands of people downloaded my second book while it was free and quite a few apparently felt they didn't want to start with the second in the series and so picked up Crown as well. I can only conclude two things from this: One, all those people who recently picked up Crown and Avempartha, must have liked what they read. And two, My wife Robin is a marketing genius. Today I was greeted with a congratulations tweet from Jamie Todd Rubin, a local sci-fi writer who posted the arcane message: "Congrats for being a GoodReads Choice nominee" This was confusing as I had no idea there was such a thing as a GoodReads Choice Award, much less that I was nominated, or had the ability to be nominated. Mr. Rubin knew more about me than I did. 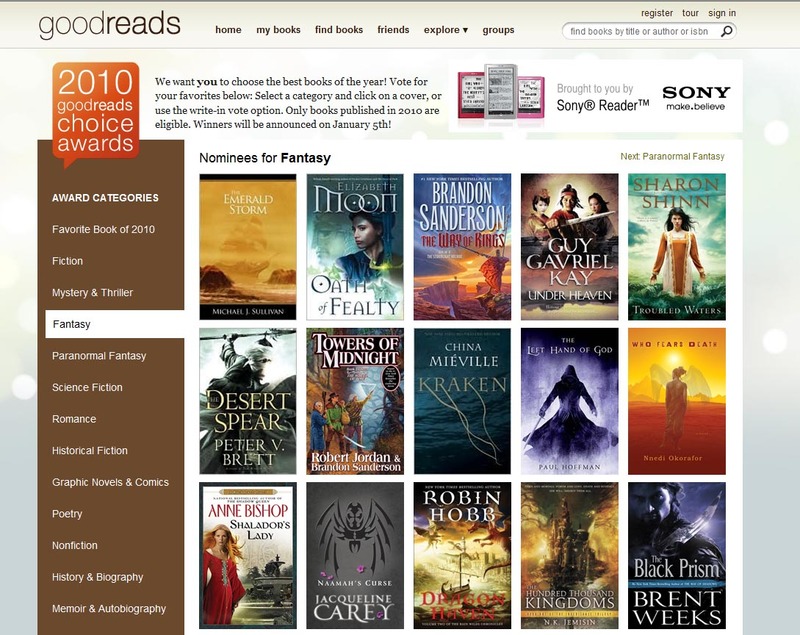 I followed this link and discovered I was indeed in the running for best in fantasy for 2010. There are only 15 books in my category, and if we were playing the "What thing doesn't belong" game, The Emerald Storm, would be the easy choice. Brandon Sanderson, Brent Weeks, Guy Kay...these are all big names, all put out through major publishers. And then there is Emerald Storm? That's sort of like, lion, tiger, bear...spaceship. Something like this happened once before, about six months ago when Avempartha was nominated for the BSC’s fourth annual Book Tournament. Pitted against a number of similarly accomplished authors, my book did manage to win, but that was a far more limited pool where my fans were able to take bully-clubs and bats to the opposition. 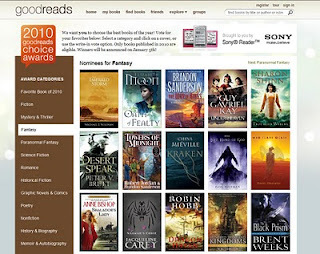 Voting on the BSC site ranged in the forties; GoodReads has well over a million users. I don't think my Riyrian Army has much of a chance against those odds. Granted I didn't expect to survive my first round on the BSC and ended up winning, but given the difference here, given the dramatic change in venue, and the quality of my fellow nominees; I think this is one of those situations where I can truly say, it's enough to just be nominated. Well, actually, it's amazing, shocking, astounding, and even a bit bewildering--but in a good way. So thanks to those GoodReaders who put me on the list. And thanks to Jamie for the heads-up. Now I have to figure out who I should vote for.